Grief is one of the most devastating experiences that any human being can face. 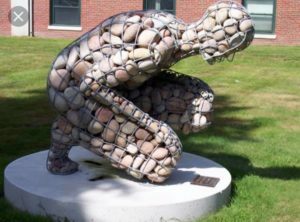 This Sculpture by Celeste Roberge expresses so much about the heaviness and weight of grief that can feel debilitating and overwhelming at times. Often loss is at the heart of the matter when it comes to grief - a loved one has died, a job has been lost due to redundancy or retirement or it could be more related to the loss of reputation, loss of a relationship or something else. As an adult I was very close to my Dad and we spent much time together on holidays, at football matches, on day trips and more generally just enjoying father and son time together. On Christmas day 2016 it became clear that my Dad's health was beginning to fail. Over the next 18 months he struggled with various health challenges. Due to serious illness in 2018 he faced a punishing treatment regime of both radiotherapy and chemotherapy. Family gathered round and showered love and care on him. Over several months we supported him, nursed him and cared for him as a family. In those days he especially knew without a shadow of a doubt how much he was loved. On 30th September 2018 my Dad died. When you deeply love someone it may well become a double edged sword when faced with losing them. The more you love, the more painful the loss is felt. Much of your future horizon becomes distorted, shrouded and hidden. All that remains, for a time, is the dominating awareness and heaviness of grief. Mindfulness is certainly not a quick and easy solution when it comes to handling and coping with grief. Recently I had the privilege of speaking to a group of Salvation Army Officers in London - well-being officers and trained counsellors. For me these people are the salt of the earth and help provide services in communities across the UK to help the hurting, homeless and poor. Many have been involved in helping with the recent Grenfell Tower disaster and seeking to show compassion and comfort to a broken community that is struggling with tragedy and loss. One of the myths regarding mindfulness meditation is that it will always transport you to a place of deep calm and blissful peace. I have experienced deep calm and a wonderful sense of God's peace through meditation but not always. During my day in London I shared various teachings and meditation practices with the group. The last meditation of the day was called Welcoming Prayer. This is part of Centring Prayer practice and is available as part of the Christian Contemplation Course on this website. Accepting and welcoming grief is one of the most challenging and difficult things we can ever do in this life and Welcoming Prayer can involve just that. It's very much up to each individual how close you want to go to feelings of grief. And it may not be appropriate or manageable for you to do so at this time. So be careful before attempting this for yourself. My experience of Welcoming Prayer was difficult and painful in the face of my own grief. The weight of grief was particularly heavy for a few days. I chose to acknowledge, accept and welcome the truth. Not because I am a masochist, but because I felt ready, in a safe place, to face appropriate feelings of sadness and grief. Since that time (a few weeks ago) I have begun to feel some of the weight of grief lifting like shafts of light into a very dark place. I'm sure there will be many moments when grief breaks into my awareness again. But I feel more able now to agree with the well worn phrase - It is better to have loved and lost than to have never loved at all. 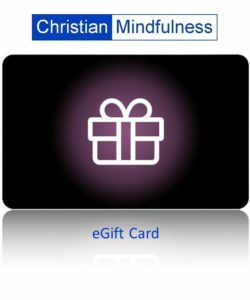 Both the Christian Mindfulness and Christian Contemplation resources offer crafted meditations designed to help you encounter God and grow in relationship with Him. See here for more details.